Size of the INDUSTRY Spread all around the country with Textile, Cotton and other handicrafts items. The real India resides in Rural India. Large portion of the rural population of India acting as one of the major sources of its economy is supported by Cottage Industries which is responsible for having hugely preserved the cultural heritage of India. Cottage Industry not only maintains a distinct identity of its own but also provides it with a unique platform to display its specialty when there is a tough competition faced in the international markets. It is only because of Cottage Industries the indigenous goods can fairly compete with the foreign goods due to the impression of Indian culture that makes them unique. Cottage industries or the small scale industries (SSIs) are usually the terms used for small business carried on at home involving less number of people as laborers who may or may not be the members of one family and sometimes, such a production or manufacturing of goods involves the traditional artisans and craftsmen who have inherited their work as an art form from their ancestors. Their various goods produced include dress fabrics such as khadi, wool, muslin, leather, silk, cotton etc, & many precious items like jewellery, ornaments, statues, idols, gems, stones, etc and also edible items like spices, oils, honey, etc have a huge demand not only within India but also in the foreign markets. Since ancient times in the country such indigenous products have always been able to attract foreign traders and merchants. These helped India in successfully establishing trade relations with the Greek, Chinese and Arab merchants. Even during the period of medieval India, Indian craftsmen and artisans flourished well under the rule of the Turk, Afghan and Mughal dynasties. But from the advent of the East India Company, there was a drastic change in the running of these cottage industries. For an urge to have more luxury items at the cheapest prices, the European traders and merchants exploited the Indian peasants to great extent due to which these cottage industries witnessed a severe lash to their production. Later the Industrial revolution in the West also gave a fatal blow to their economy and led to considerable decline in the number. Although the Gandhji led 'Swadeshi' and the 'Boycott' movements helped in the promotion of khadi and other Indian fabrics, they could not help much in saving the decline in the manufacturing of the items that involved fine work as well as an artistic taste. Since 1947, after Indian independence there was a much-needed change that was introduced in the country for the improvement of the economic condition of India. As a consequence of which, the cottage industries were neglected again but later they became an integral part of India's five-year plans. Since then today after several years of Indian independence, the contemporary condition of the small scale industries is under control more than ever before. They are operated with a joint co-operation of the public and the private sectors. Today every state in India has its own set of cottage industries whose art and craft items depict the traditional art form and the culture of that particular state. Cottage Industries have proved to be well for those who were self-employed or unemployed by providing them with the means to earn their livelihood. Government of India on October 2,1993 launched The "Prime Minister's Rodger Yolanda Scheme",(PMRYS) for the educated but unemployed youth and for providing them with self-employment ventures in Industries, Services, Business, etc. Today it provides them with training in the Government recognized or government- approved institutions. Under the Ninth Five-year Plan Period, a target of training 90,500 persons was made out of which 68,525 persons were actually trained and 73,672 applications were sanctioned for providing financial assistance to the tune of Rs. 380.84 cores and an amount of Rs. 297.21 cores was actually dispersed to 59,578 applicants. Under the Government's Tenth Five-year Plan, the areas identified for the development of SSIs are Leather and Leather products, Textiles and Readymade Garments, Gems and Jewellery, Pharmaceuticals, Information Technology, Bio-Technology, Automobile Componenta, Food Processing, Coir Industries, etc. Introduction of Market Development Assistance scheme (MDA), Entrepreneur Development Institute (E.D.I. ), State Industries Centers - EDP Training, Women Entrepreneur Development Programme, Construction of DIC building, maintenance, contribution to specific fund (TTM), Assistance to Coir Industrial Co-operative Societies, assistance for setting up of Industries (Capital Investment Subsidy to SSI Units) etc, has made it possible for the cottage industries to flourish well. Indian Cottage industry is generally unorganized sector and falls under the category of small scale industry. The industry produces consumable products through the use of conventional methods. Such type of industries originates usually in the country sides where unemployment and under-employment are widespread. The Cottage Industries faces major risks from medium or large industries which demand huge amount of capital investment for all types of hi-end technologies. Indian Cottage Industries are destined to play a significant role in the economic development of the country while keeping in view the potential for employment generation, preservation of cultural heritage and the dispersal of industrial activity into the backward regions. In recent past Cottage industry has played a commendable role in the economic development of the Jammu and Kashmir State, as it affords great potential for exports and employment generation. The industry is particularly an export-oriented as more than 90% of its total production is exported to many foreign countries. 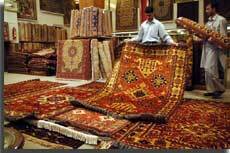 Every region in our country abounds in beautiful handicrafts, handlooms, carpets, etc. Freedom Tree attempts to help keep some of these crafts in the limelight by sourcing its products from rural artisans and craftsmen across the country. It features Indian culture in a very unique way and helps preserve it by marketing products which are hand made. Freedom Tree celebrates India though its vibrant and colourful designs. The Freedom Tree Design store's products have an impression of our cultural heritage imbibed into them that makes them unique. With its focus on promoting Indian craftsmanship, Freedom Tree Design store has a host of ceramic, textile and lacquer ware products that are all made in India and have a global appeal to them. The products are designed and made by hand, making each one a unique piece. Another major occupation in Indian villages other than agriculture in India is the cottage industry. This industry has emerged as a major source of employment in Indian villages over the period of time. Many people are involved in various kinds of art and crafts works. The villagers produce different types of handicrafts products and many of them are earning their livelihoods by marketing them. The occupations like artisan in pottery, wood, cloth, metal and leather have been in existence in Indian villages, since the ancient period and are found even in the modern times. 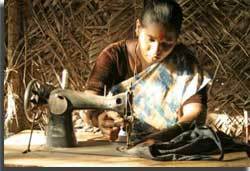 Many Indian villagers are dependent on these occupations to earn their livelihoods. Indian Cottage industries provide opportunity for the development of handicrafts in the country. 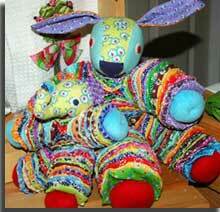 In places like KONDAPALLI and NIRMAL hand- made toys are the main occupation for the people. The LEPAKSHI sarees are famous and dyeing is a prominent in the industry. In many villages match boxes are made all around the country. Carpets are also are part of cottage industries. With the advent of the British cottage industries in our country suffered a setback. Industrial revolution brought about a craze for goods made on machines. People depending on cottage industries lost their livelihood. After independence cottage industries are again encouraged. Government now provides the needed financial assistance to these. Product of cottages industries are sold through special counters like the LEPAKSHI stalls.